It’s a big moment for parents when their child’s first tooth appears. Not only is it a developmental milestone, it’s an indicator that the time has come to begin establishing those early dental habits that will hopefully last a lifetime. The vast majority of parents in the United States are diligent about scheduling regular dental visits for their children. In fact, the United States Centers for Disease Control state that nearly 85 percent of children ages two through 17 have had a dental visit in the past year. However, this percentages drops to 64 percent in adults between the ages of 18 and 64. 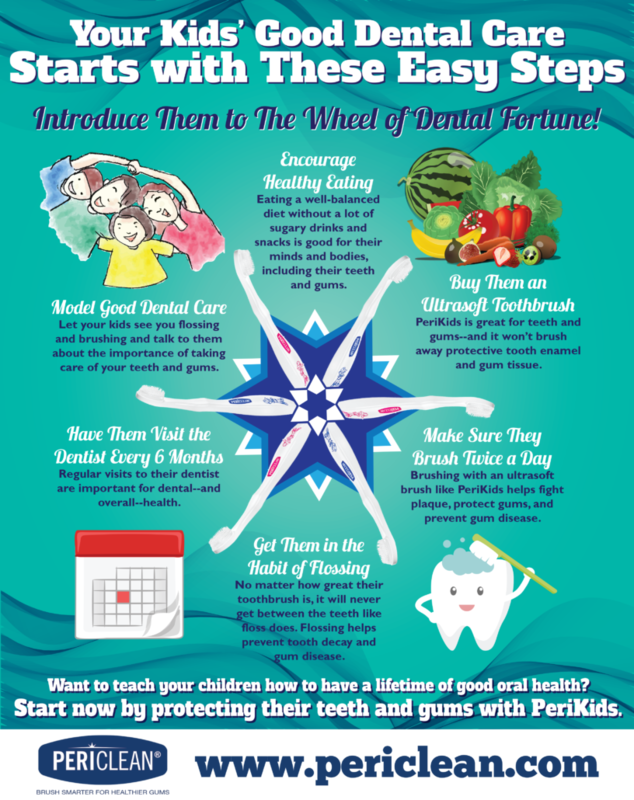 Here are some tips to help your kids along their lifelong journey of healthy teeth and gums. Regular dental check-ups and cleanings are valuable for keeping teeth clean and identifying problems early before they require extensive treatment. They also teach that oral health is an essential part of overall wellness. Children who see a dentist on a regular basis typically have a good, positive attitude about cleanings and treatments and will likely become part of the segment of adults who obtain regular dental visits. Show your kids that taking care of your teeth is important to you. This includes brushing and flossing at least twice a day to control bacterial plaque that leads to tooth decay and cavities. Include children in your routine so that it become part of regular daily activities. Along with good dental habits, it’s important children have the right products to protect their teeth and gums. Fluoride toothpaste, floss and the right toothbrush are essential. Because gum tissue and tooth enamel are fragile, avoid nylon bristle toothbrushes that are abrasive. The patented Ultra Soft bristles of the PeriKids® toothbrush are ideal for protecting the teeth and gums of children. 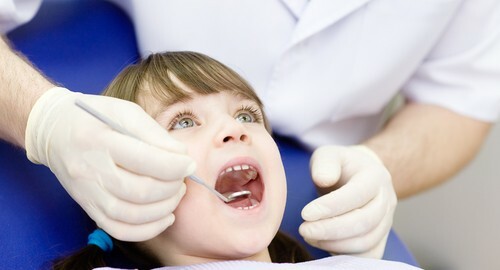 Dental visits can be perceived as scary to children. Yet, the right dentist can change a child’s view about dental cleanings and treatments. One who specializes in pediatric dentistry has experience with the unique needs of children. Carefully check reviews and references and choose one who is kind, friendly and puts you and your child at ease. Tooth decay is among the most common dental conditions in children. Untreated, it can lead to pain, infection and even tooth loss. Although dental care is widely available in the United States, about 20% of children, ages 5 to 11, have at least one untreated decayed tooth, according to the Centers for Disease Control and Prevention. In adolescents, the number is about one in seven. While the prevalence of tooth decay may seem surprisingly high, the good news is that this common condition is almost always preventable. Fluoride varnish can prevent about one-third of decay in baby teeth. Fluoridated tap water and fluoride toothpaste also help. As well, dental sealants to chewing surfaces on back teeth are effective in providing one more layer of protection against tooth decay. As a parent, there are also proactive strategies for protecting your child’s teeth. Along with using fluoride toothpaste, it’s important to choose the right toothbrush. Nylon-bristle brushes abrade fragile gum tissue which can make teeth more vulnerable to decay. By making the switch to a rubber-bristle brush, you can ensure that daily brushing isn’t doing more harm than good. Younger children often don’t have the motor skills to effectively brush their teeth. It’s also helpful to help with brushing and flossing, as well as by demonstrating, by example, proper dental care techniques. Of course, what your child eats and drinks can dramatically impact their oral health. By limiting sugary snacks, soda and other refined carbohydrates, you can minimize damage to tooth structure and gums. A balanced diet and plenty of water is not only good for overall health, but also for maintaining a healthy smile. While most adults have at least a few dental fillings from childhood, cavities and tooth decay shouldn’t be considered a rite of passage. Don’t let your child be among the one in five with untreated tooth decay. Make dental care a daily activity and stay current with regular dental cleanings and checkups. By doing so, your children will thank you one day for helping them navigate the first steps in their lifetime journey of dental health. As a parent, you want to do what’s right for your child. Yet, sometimes what seems beneficial can actually be a bad idea. The following are four common habits that can actually put a child’s teeth at risk for tooth decay and gum loss. Many parents are surprised to learn that tooth decay has made a comeback, and one unlikely culprit is bottled water. With concern over the safety of tap water, many parents have switched to bottled water for their children. Yet, because bottled water typically doesn’t contain fluoride, it can lead to increased risk of tooth decay. In a recent study published in the American Journal of Preventive Medicine, children who did not drink tap water were found to have measurably higher rates of decayed tooth surfaces. If your child doesn’t drink fluoridated water, it’s important to discuss fluoride supplementation with your dentist. Fruit juice is often thought of as a nutrient-packed alternative to soda. While some juices have concentrated amounts of nutrients, they also contain high amounts of sugar which can harm children’s teeth. Sugar is consumed by bacteria in the mouth and converted into acid which wears away tooth enamel, irritates gum tissue and can cause cavities. Reducing the amount of juice your child drinks can lower the levels of bacteria on teeth, preventing this cycle which can eventually lead to tooth decay and gum disease. As most parents know, getting children to brush their teeth can be a challenge. Although the frequency in which children brush their teeth is important, so is the toothbrushing technique. Aggressive brushing, especially with a hard bristle toothbrush, can damage gums and tooth enamel. For children, a smarter choice is a toothbrush with flexible, rubber bristles that are effective at cleaning teeth and gums but don’t abrade gentle tissues and surfaces. We associate a white smile with good health. Yet, whitening toothpastes can actually wear down tooth enamel. Because tooth enamel doesn’t rejuvenate, these products are especially detrimental for children. With many decades ahead of toothbrushing, it’s important to use a gentle toothpaste that protects enamel. Your best option is to look for a product with the ADA seal of approval formulated specifically for children. Dr. Jack Gruber DDS discusses why many children don’t like to brush their teeth and how to get them brushing properly. Are you doing enough to protect your children’s teeth from cavities? Most parents are surprised to learn that nearly 20 percent of all children from ages 5 to 19 have untreated cavities (dental caries). Caused by bacteria eating away the outer protective layer of tooth enamel, cavities can cause tooth pain and weakness, as well as require dental treatment. Yet, there are ways to prevent tooth decay in children. Establishing early habits that promote good oral health can go a long way towards minimizing the chance of tooth decay. From the time a child is two years old, they can start using a pea-sized amount of toothpaste. By the time they are old enough for school, they should already be in the habit of brushing twice a day and flossing at least once a day. Regular brushing and flossing helps to remove bacteria on and between teeth that can turn into a sticky film called plaque. If plaque isn’t effectively cleaned off of teeth, it can damage enamel and begin the first stages of cavities. The following are some simple ways to prevent tooth decay from starting. Tap water in most locales in the United States contains fluoride which helps to protect against tooth decay considerably. When possible, choose tap water over bottled water which typically doesn’t contain fluoride. When a child is continuously eating and drinking throughout the day, their teeth are constantly exposed to acids which can form into mouth bacteria and plaque. Stick to healthy meals and a minimum of sugar-free snacks each day. Most dentists will recommend an oral rinse for children who are at a high risk for tooth decay. A fluoridated or antibacterial mouth rinse can help protect tooth enamel and eliminate bacteria and plaque in the mouth. Dental sealants are thin coatings that are painted on the chewing surfaces of back teeth to prevent cavities. School age children that don’t have sealants have three times more 1st molar cavities than those with sealants, according to the Centers for Disease Control and Prevention. It’s likely that your child’s dentist will recommend sealants when they reach school age. In some areas, there are school-based sealant programs to help children who are at higher risk for cavities. For most kids, a trip to the dentist is a mixed blessing. It may not be their favorite thing to do in the world, but most understand the importance of having their teeth cleaned and maintaining a cavity-free smile. Often, there’s a deal in place for a good behavior award after a trouble-free visit. For children with autism spectrum disorder, it’s a different experience. A dental appointment presents a daunting array of sensory challenges. With bright lights, hard surfaces, strange equipment, and a high-pitched whirl of dental devices, the dentist’s office can be an overwhelming experience. According to a study published in Pediatric Dentistry by researchers from University of Southern California, nearly 20 percent of children with autism have required restraints during dental visits, and nearly 40 percent required pharmacological methods, such as anesthesia during cleaning. Parents of children with ASD face countless challenges each day. Knowing your child is going to encounter a perplexing set of unknowns at the dentist’s office means it might be best to develop a strategy prior to the visit. It’s important to set aside time to prepare yourself and your child for this significant event. Ask if you can bring your child to the dentist’s office prior to the appointment to meet the staff, check out an examination room, experiment with sitting back in the chair and generally get used to the environment. Find out if you’ll be able to sit next to your child during the examination. Let the dentist know your child may have difficulty answering questions or expressing themselves. Discuss “Tell, Show and Do,” with the dentist. In other words, the dentist should first explain or tell your child what’s about to happen, then show your child the tool or device that’s going to be used, then do, or perform the next part of the procedure. It’s important that your child be reassured every step of the way. Stress the importance of constant communication and positive feedback to eliminate uncertainty. There’s also homework you can do with your child to prepare for the visit with the dentist. Learning how to brush properly is a task that requires daily practice and is a fun exercise you can do together. Hard, nylon bristle brushes can be particularly unpleasant for children with sensory challenges. It can be worthwhile to experiment with a softer alternative that doesn’t provide an abrasive feeling. You can also desensitize your child to what happens in a dental exam by using a small, plastic hand-mirror to explore the inside of his or her mouth. Make a game out of counting teeth or examining gums. Playing dentist can help soothe their fears of the unknown. Another excellent idea is to find a book about going to the dentist and personalize the story by inserting your child’s name. The main idea is to eliminate surprises wherever possible. There are many successful dental visits performed with children with ASD every day. If you take the time to prepare in advance you will reap the reward of a stress-free (or at least a less stressful) dental appointment. We teach our children from an early age to brush their teeth each and every day because it is vital to maintaining a healthy smile. While most parents are focused on just getting kids to brush their teeth; far fewer take the time to actually learn and teach their children proper dental hygiene and brushing technique. After all, many adults are guilty themselves of aggressively over-brushing their teeth when using standard nylon-bristle toothbrushes. Is it any wonder our children would follow suit? When it comes to brushing, there can be something as too much of a good thing! What’s the big deal you might ask about over-brushing if teeth are getting clean? A lot! Many parents are surprised to learn that children who over-brush their teeth are at risk of developing both sensitive teeth and periodontal disease. Brushing vigorously with a medium or hard-bristled toothbrush wears down tooth enamel and pushes gums down, exposing the inner nerve part of the tooth. Even a soft, ordinary nylon bristle brush will wear down the teeth and gums over time. Children are especially vulnerable as gums can weaken and begin to erode. Once gums begin to recede, other dental problems can ensue — including cavities on exposed roots, which often need to be treated with fillings, root canals, gum grafting or tooth extractions. 1. Use a soft bristle toothbrush, or even better, a rubber-bristle toothbrush, like the PeriClean and PeriKids Ultra Soft Specialty Toothbrush. 2. Use a fluoride toothpaste. 3. Don’t share your toothbrush. 4. Hold the toothbrush flat against the teeth and move it back and forth along the gum line to sufficiently remove plaque. 5. Clean the outer surfaces and inner surfaces of teeth, including chewing surfaces. 6. Don’t forget to brush the tongue, too! 9. Limit snacks between meals. 10. Visit the dentist at least once every six months for an oral exam and professional cleaning. Consider that your child’s gums are the skin of their teeth. You would not teach your child to aggressively scrub their skin with an abrasive brush? So why would you have them use a medium or hard-bristle toothbrush on their teeth and gums? Proper dental care is essential to your child’s health. With a mastery of proper brushing techniques, your child will be able to keep their teeth and gums for a lifetime. Now, that’s something to smile about! The choice is yours. Dr. Jack Gruber, DDS is a periodontist in clinical practice for more than four decades. 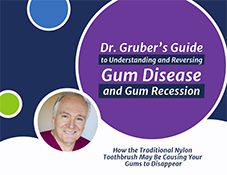 After many years of research and testing, Dr. Gruber created the PeriClean, an alternative to standard nylon toothbrushes to combat gum recession caused by toothbrush abrasion. Its design minimizes forceful brushing that causes damage to the teeth and gums while removing plaque with a textured surface. From a baby’s first tooth to visits from the tooth fairy to twice yearly dental visits, and braces, childhood is filled with plenty of dental memories. To ensure healthy teeth for years to come it is vital for children to learn preventive dental care habits from a very early age. This includes brushing of course as well as several necessary steps to help keep teeth and gums healthy for a lifetime. While kids are notorious for disliking flossing, it is an essential part of oral hygiene. Flossing is the only way to get in between teeth to remove food particles and plaque. Brushing alone cannot effectively remove bacteria and food. Ninety percent of bacteria reside in between teeth, and only dental floss can access these areas of the mouth. Teach by example and continue to stress the importance of flossing even when you get complaints and protest! It might not be until they become parents themselves but your children will thank you later on! Do Not Forget the Tongue! While teeth and gums are a primary focus, it is also important to teach kids to clean their tongues. The tongue has areas that can hide bacteria and promote the development of plaque and bad breath. Make it fun by sticking tongues out in front of the mirror and brushing while making funny faces! Tartar forms when bacteria builds up on the teeth. This can result in inflammation and even bleeding gums. When this happens, it is time to visit the dentist. Remember only dentists and dental hygienists can safely remove tartar from teeth. 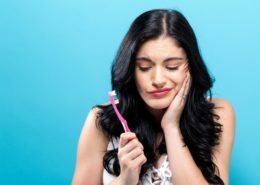 A dull ache or even sensitivity when brushing may be signs of more significant problems such as receding gums or a dead nerve inside a tooth. Ask your dentist about sealants for the biting surfaces of your child’s teeth. The grooves are susceptible to decay even with good brushing habits. Get your kids in the habit of brushing at an early age. Advise them to brush for two minutes twice daily front, back and on biting surfaces. It is also important that they have the right technique and type of toothbrush to protect their teeth and gums. Standard nylon toothbrushes can be especially harsh and irritating for children’s delicate, sensitive gums. Children (and adults too!) often brush much too aggressively, which can lead to serious problems later on in life! Each year, an estimated 24 million people suffer from what the Medical College of Georgia School of Dentistry has labeled as “toothbrush disease.”The term means gingival recession and wear of the root surface caused by over brushing, which contributes to receding gums and hypersensitivity of the teeth. Do yourself and your family a favor: put up a sign in your bathroom to remind your family: faster and harder brushing does not mean cleaner teeth. Over-brushing can lead to receding gums and painful surgery! Another option is to get in touch with me about purchasing a specialty toothbrush I created called the PeriClean and PeriKids Ultra Soft Specialty Toothbrush for children up to 12 years old. Its patented, ultra gentle design allows children to brush their teeth easily and comfortably even when losing their primary (baby teeth) and as their permanent teeth grow in. I also designed it with a thick, contoured handle making it easy for children to use. Just remember this: proper dental care is a lifelong responsibility that begins in the toddler years and continues throughout adulthood. By teaching these important habits during the formative first years, you can give your child one of the most amazing gifts of life – a healthy smile! 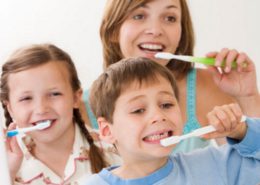 Does your child struggle with the everyday routine of tooth brushing? This is a common challenge that many parents and their children face. Yet, there are some simple ways to get them to develop a healthy oral care routine without an argument or having to call a timeout. In fact, once you your child gets the hang of it, you’ll be amazed at how enthusiastic they are to brush. The time to begin introducing tooth brushing habits is not when they already have a full set of teeth and the words to argue with you! Instead, begin reinforcing the importance of brushing teeth as soon as the first teeth begin to appear. Tell them on a regular basis that daily brushing will help them keep a healthy smile and prevent painful cavities. The best way to encourage your child to get into the habit of daily tooth brushing is to brush with them. Get down on their level and let them see how you brush your teeth. Demonstrate by brushing gently up-and-down, in circles or back and forth, whatever is easiest for them, for at least two minutes, and don’t forget to show them how you brush your tongue as well as floss. Today’s parents and kids have more flavors and varieties of toothpaste to choose from than ever before. Choose a kid-friendly toothpaste that your child will like and be sure to involve them in the decision making process! In giving them the choice they will be more likely to look forward to brushing. Just be sure to purchase small tubes as tastes can change. Who knows — they might even look forward to using up each tube in order to try out a new flavor! Not all Toothbrushes Are Created Equal: Bristles Matter! Not all toothbrushes are created equal. Standard nylon toothbrushes can be especially harsh and irritating for children’s delicate, sensitive gums. Children (and adults too!) often brush much too aggressively, which can lead to serious problems later on in life! Remember just as faster and harder brushing does not result in cleaner teeth; neither medium or hard bristles clean any better than soft bristles. The safest option is the PeriKids Ultra Soft toothbrush which features patented rubber bristles that are gentle, even on the gums of young children. It can be tempting to continue to brush your child’s teeth long after they have sufficient manual dexterity to brush their own. However, this approach does not help them develop the lifelong skills they need to keep their teeth and gums healthy. At around two years old, teach your child how to put toothpaste on a toothbrush and master toothbrushing techniques. Yes, you may need to offer some help early on, but you will be going a long way towards establishing early dental habits. Toothbrushing time should be a time for fun instead of a chore or a battle of wills. Make toothbrushing a family event and figure out who can make the silliest face while showing off their pearly whites. Have everyone hum to a tune, or play a favorite song to ensure you and your family are brushing long enough. Consider even downloading an app such as Brush DJ, which plays two minutes of music from your library. 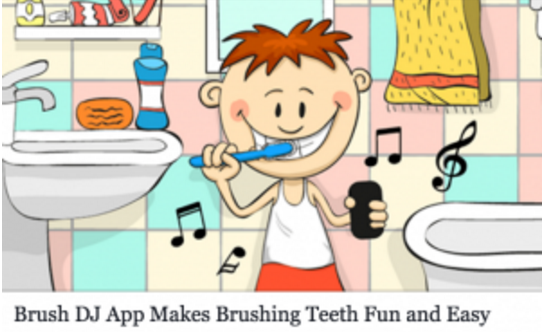 Click here and here to find lists of some other popular dental health apps for kids. 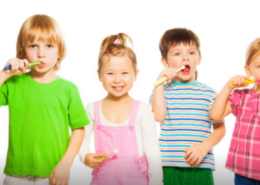 Early tooth brushing establishes a foundation for a lifetime of healthy oral care. Provide positive reinforcement when your child remembers to brush on their own or when they’ve mastered the ability to brush for two minutes. Consider incorporating incentives by creating a sticker chart and giving them stars for when they proactively brush their teeth without a reminder. Two minutes, morning and night, tooth brushing is a small fraction of your child’s day, but it can have a profoundly positive effect. By making oral care a priority and not an afterthought at the end of the day, you can help ensure your child’s healthy smile for a lifetime. 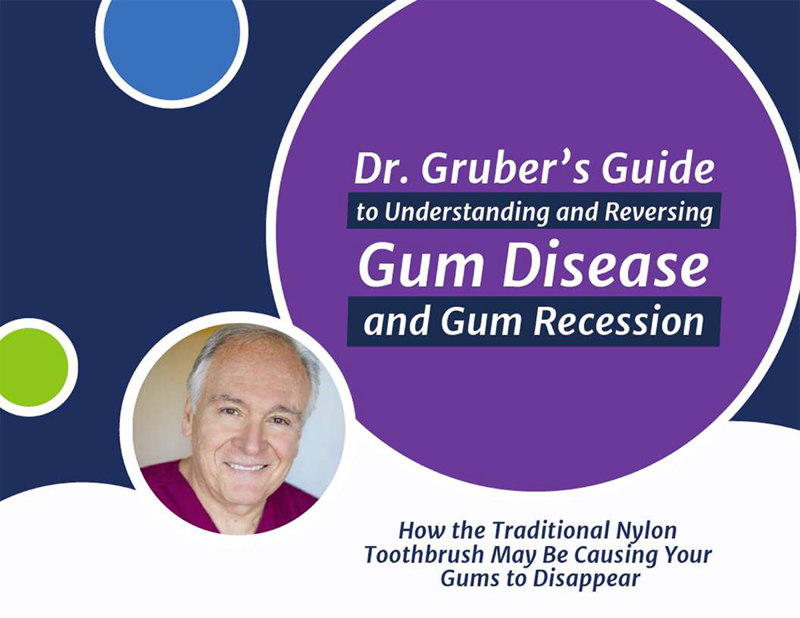 Dr. Jack Gruber, DDS is a leading authority in the silent epidemic of gum recession and gum disease and an award-winning periodontist in clinical practice for more than four decades. He recently authored Dr. Gruber’s Guide to Understanding and Reversing Gum Disease. After many years of research and testing, Dr. Gruber created the PeriClean, an alternative to standard nylon toothbrushes to combat gum recession caused by toothbrush abrasion. Its design minimizes forceful brushing that causes damage to the teeth and gums while removing plaque with a textured surface.